"The child is father of the man," Wordsworth wrote. And if you choose to believe him, it gets my Dad off the hook for literally tons of ridiculous stunts that I've pulled throughout the years. 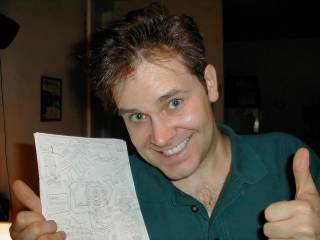 It also explains why the "humor" you've gotten used to at this Web site so closely mirrors what's found in the comic book below. 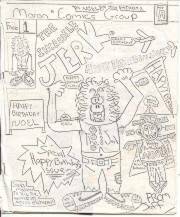 Published more than 20 years ago, "The Incredible Jerk #1" is an 11-year-old's birthday tribute to his cousin Noel, written and illustrated by yours truly. 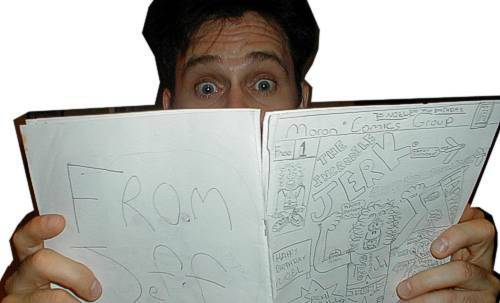 Family members that are featured in this unbelievable 9-page comic journey include my Uncle Earl, Aunt Liv, Cousins Allison and Seth and, of course, Noel himself [as "Super Noel" for reasons that have escaped me over the course of two decades]. Today, they all live normal, well adjusted lives, and sometimes they can even be found pictured in jeffthomas.com photo updates. The character of "The Jerk" has also gone on to larger things, including a big Hollywood bio-pic starring Steve Martin. Meanwhile, reasons why the author has shown so little artistic or intellectual growth since he was in the 5th grade remain a mystery. Butheyisn't it nice to know that some things never change? Enjoy!